Line two 8x3-inch square baking pans with two strips of non-stick tinfoil or parchment paper for easy removal. Pound Cake Letters: Make the 3 pound cake mixes according to package instructions and equally divide the batter among the two 8x3-inch square pans. Bake for 65-70 minutes, until a thin wood skewer inserted into the center of the cake comes out clean. Cool cakes in pans for 10 minutes, then remove cakes and set on a cooling rack and allow to cool completely. Trim off the domed top and about 1/4 inch from the sides of each cake. Cut cakes into 8 slices, about 3/4 inches thick. Lay the slices flat on non-stick tin foil or parchment paper-lined baking sheet. Set in the freezer for at least one hour. 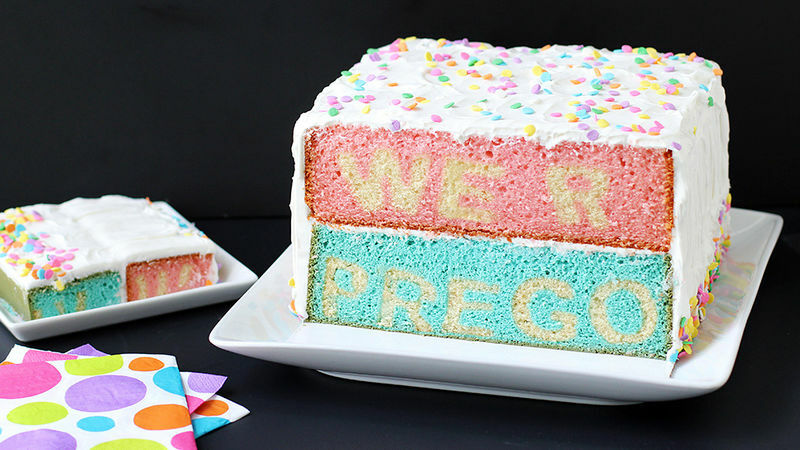 Remove 2 slices of cake from the freezer at a time and use small alphabet cookie cutters to cut out the letters needed to spell out “We R Prego”. Refreeze letters for about an hour. Cake Layers: Preheat one or two ovens to 350°F. Mark the front of each cake layer by cutting or marking the foil or parchment paper. Pink Cake Layer: Combine Betty Crocker™ White Cake Mixes with white chocolate pudding mixes, sour cream, egg whites, milk and oil. Mix on low speed for 30 seconds. Add pink food coloring and increase speed to medium mixing for 2 minutes, scraping down bowl and adding more pink food coloring as needed. Pour some of the cake batter into a piping bag. Pipe pink batter into the openings of the cake letters, filling them 2/3 full. Pipe a thin layer of pink batter over the bottom of one of the square pans. Set the letters “WE R” in a row about 1/2 inch from the front of the pan. Continue to add letters, piping batter in between as you go, until you have 8 rows of letters in the pan. Pipe batter all around and over top of the letters. Bake for about 1 hour 25 minutes, until a toothpick inserted in the center comes out clean. The top of the cake will get very deep brown. Repeat this process to create a blue cake layer with the word “PREGO” inside. To achieve a true blue cake, you will need to add some white icing color to the cake batter along with the blue coloring. Note: If using only one oven, allow the first cake to bake completely before making the second. It will take about 40 minutes to prepare the second cake and it's best not to open the oven door at that point in the baking process. Allow the cakes to cool for 10 minutes in their pans, then remove to a wire rack and allow to cool completely. Cut off the domed part of each cake, being sure you don't cut into the letters. Set the blue cake on an 8-inch square cake board so that the letters face forward. Spread frosting over the layer. Set the pink cake on top, making sure the letters face forward. Frost cakes. Add confetti sprinkles. To serve, cut a long slice of cake across the front to reveal WE R PREGO. It's very important that you know which way the letters face in your cake at all times. Mark the cake pan and the cake board to ensure you cut the cake correctly. 1 1/2 – 1 3/4 inch alphabet cutters. There's nothing more exciting than telling loved ones that there’s a baby on the way, so make the event even more special by sharing this amazing cake. When you set this unassuming dessert on the table, no one will suspect what's hiding inside. They’ll get so much more than a piece of cake when the surprise is revealed! Now, this cake is going to take quite a bit of time to create, but the effect is so worth it. Each time I slice into a reveal cake, I'm blown away by the reaction I get. People are in awe of the cake, and even more excited about the news being announced! Give yourself an entire day, or better yet, two days to make this large dessert. I know that seems like a crazy amount of work, but most of that time is spent waiting for cakes to bake, cool and freeze. The finished cake is dense yet super moist and wonderfully flavorful. It slices easily which makes the reveal quick and fun! This cake is made in stages, starting with baking and cutting the pound cake letters. Make 3 Betty Crocker™ Pound Cake mixes according to the package instructions. If you have a 6-quart stand mixer, you can make them all together in one bowl. Once you have the mixes made, divide the batter between the two pans. Bake for 65-70 minutes, until a thin wood skewer inserted into the center of the cake comes out clean. Cool cakes in pans for 10 minutes, then remove cakes, set on a cooling rack and allow to cool completely. Trim off the domed top and about an inch from the sides of each cake. Cut cakes into 8 slices, about an inch thick. I found it easiest to cut the cake in half, then cut each half in half, then those in half again. Lay the slices flat on non-stick tin foil or a parchment paper-lined baking sheet. If you have a side-by-side freezer and need to use small pans, you can layer the slices, just put non-stick foil in-between each layer. Cover and place in the freezer for at least an hour. …and "P" "R" "E" "O" out of the other slice. You’ll find that the cake letters don't just fall out of the cookie cutters—you have to push them out. You may be able to push them out if you have thin fingers. If not, then use a wood dowel to push the cake out of the cutters. This process takes quite a bit of time, so get comfy, put on your favorite movie, and start cutting. Once you get the first two slices of cake cut, you can grab two more from the freezer. If the cakes thaw too much, they’ll break when pushed out of the cookie cutter. So the colder, the better. Once the letters are all cut, line them up on a non-stick tin foil-lined pan and pop them back in the freezer for another hour. They need to be very firm before they’re arranged in the pink and blue cake batter. Now you’re ready to create the pink and blue cake layers. I suggest making one cake at a time unless you have two ovens. Follow the recipe to make the pink cake batter. Once again, it's best to line the cake pans with non-stick tin foil or parchment paper. If using parchment paper you might even want to create a double layer. These will be very heavy cakes to remove from the pans. It is vitally important to mark the front of each cake layer by cutting or marking the foil or parchment paper. You always need to know which direction the letters are facing! Spread or pipe about 1 1/2 cups of the pink batter in a thin layer on the bottom of one of the pans. Lay the letters "WE R" flat on a non-stick tin foil-lined pan. Fill a pastry bag with pink batter and pipe batter in all the openings of the letters, filling them 2/3 full. Be sure to fill in all the openings. If you leave any unfilled, the letters might collapse while baking and you wont be able to read them. Set the letters “WE R” down into the pink cake batter in a row about 1/2 inch from the front of the pan. Set the same letters just behind the first in the pan. Pipe batter in between and around the letters as you go. If you arrange the letters and pipe batter as you go it will be easier to keep them upright and spaced correctly. Pipe all the remaining pink batter over top of the letters and smooth it out.